Large or small, incorporating a light-filled breakfast nook into your home an incredibly perfect way to make the most of extra space in or adjacent to your kitchen. 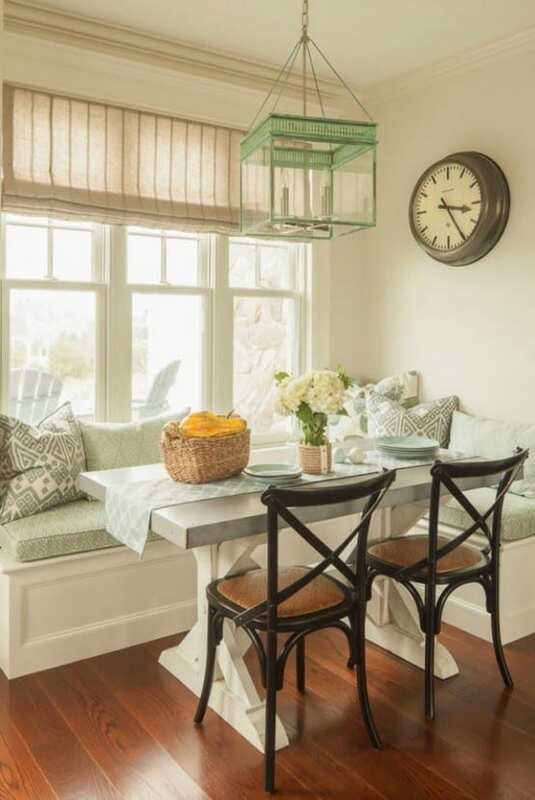 Whatever you are doing in this space, kicking back and relaxing or spending time with your family, the breakfast nook is the ideal space to begin your day. Designing this nook space next to a window is a great way to begin your day with plenty of sunshine. A combination of banquettes, built-in booths, chairs, tables that are either rectilinear or curved, dimmable light fixtures and throw pillows will help to create a cozy ambiance. If the nook is a built-in, think about incorporating pullout drawers into the seating for extra storage. 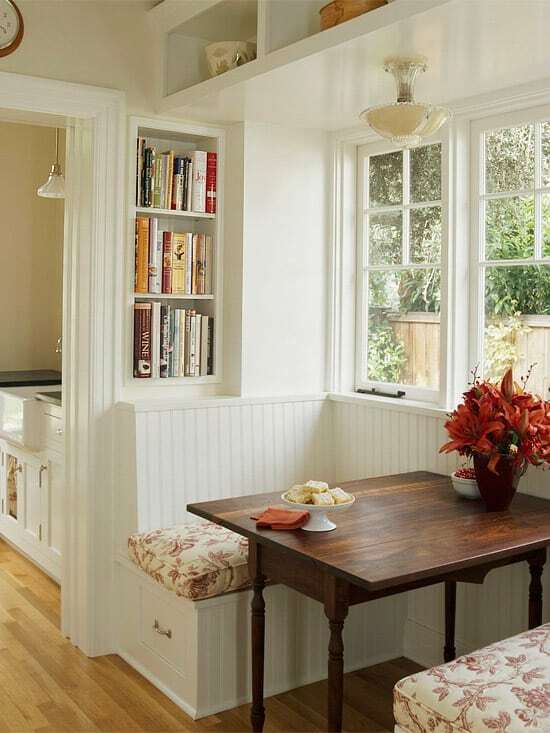 Breakfast nooks can also play double duty as homework stations and intimate spots for candlelit dinners. 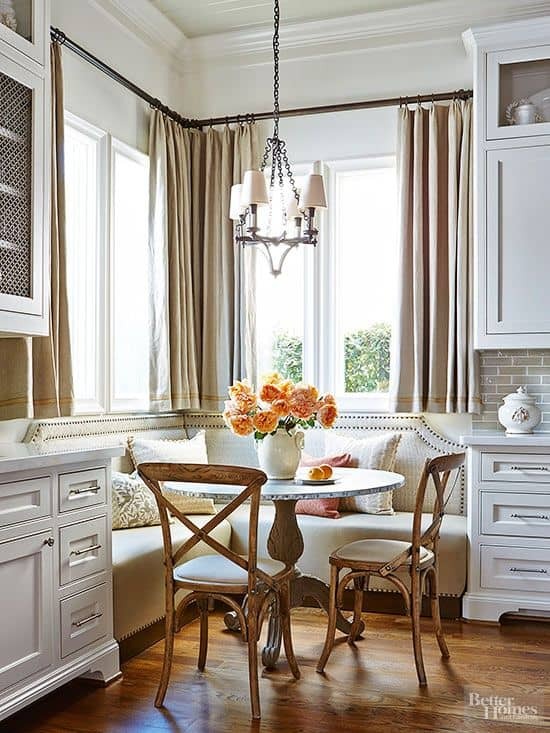 See if these super cozy breakfast nooks make you start rethinking your kitchen layout. Have a look below for breakfast nook design ideas, see how to add a breakfast nook with storage, and how to tuck one just about anywhere. 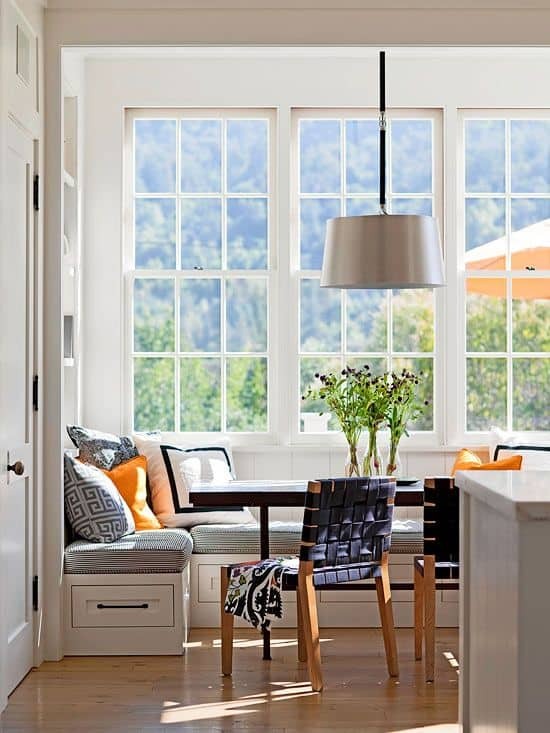 If you are looking for more ideas, have a look at one of our past articles on 63 Incredibly cozy and inspiring window seat ideas and 65 Most fascinating kitchen islands with intriguing layouts. 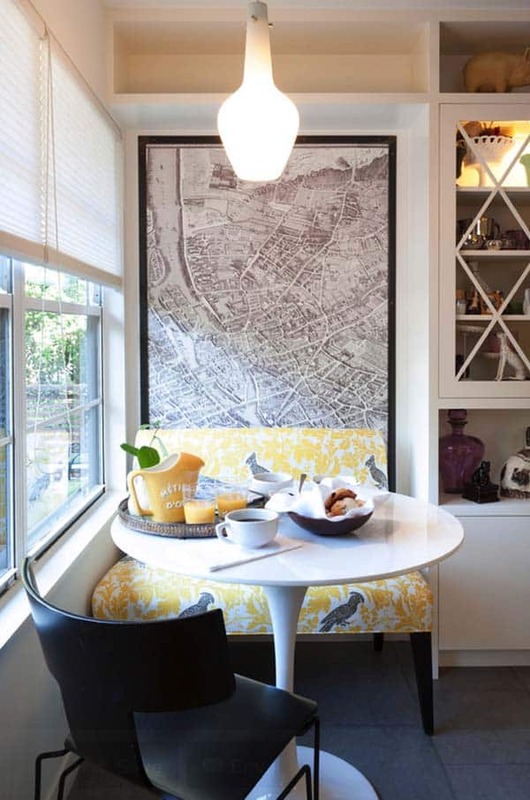 Kid Friendly: This cozy breakfast nook is a perfect kid-friendly zone. With minimalist details plush cushions, bright hues and a cool chalkboard, this is the perfect space for kids. As most parents know, this setup will unfortunately put some chalk dust on the fabrics, so be prepared to select wisely, go for materials that are easily scrubbable and very durable, possibly commercial grade. Booth Style Nook: This design uses custom millwork and is separated from the rest of the kitchen, perfect for cozy mornings spent with family and friends. Restaurant-Style Booth: This cozy booth is perfect smaller spaces where you need to pack a lot of people around a table. 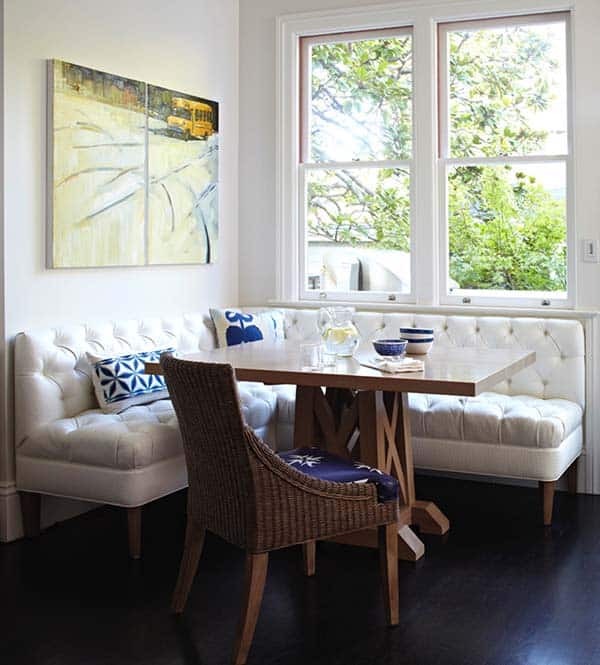 Thick tufted upholstery has been used to make this space feel inviting. 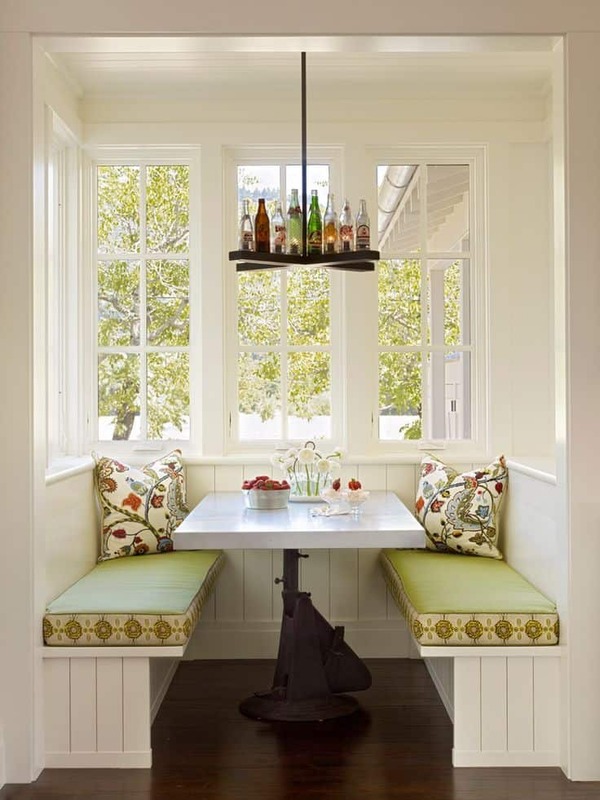 Banquette Style: Notice how this booth has a high back which helps to create a dividing wall between itself and the kitchen. 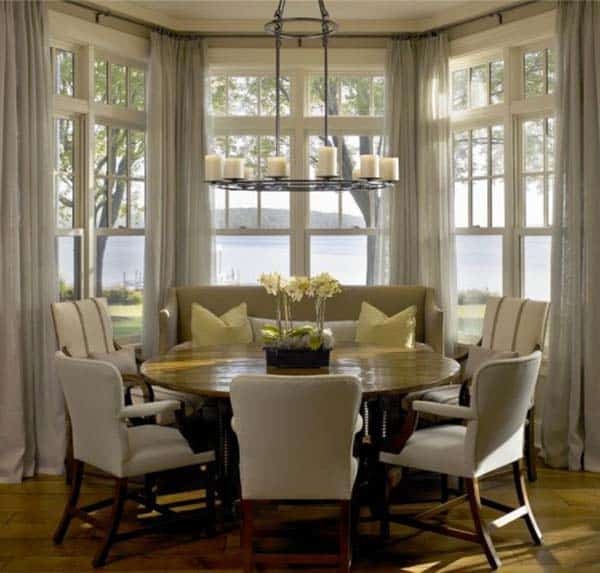 This helps to section off the spaces and make a more cozy respite to enjoy family meals. 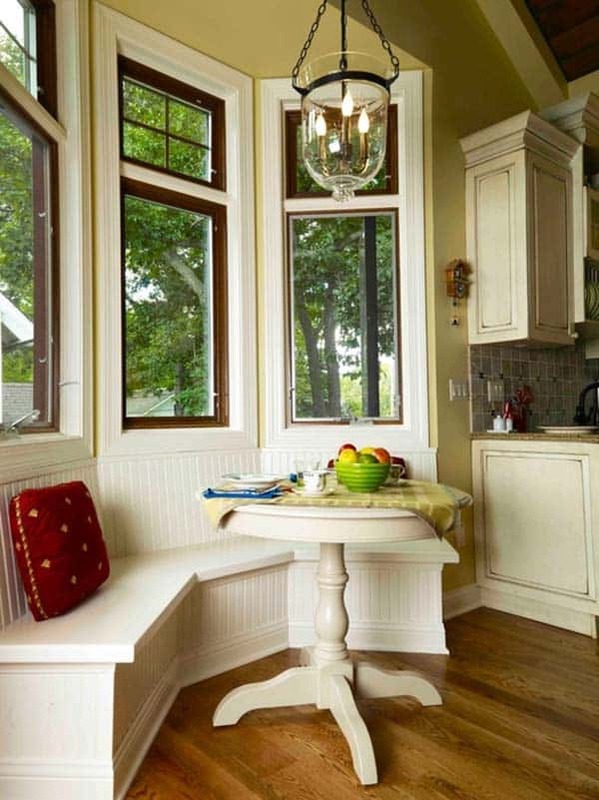 Bay Window Booth: This adorable little breakfast nook is tucked into a bay window, creating a light-filled space, perfect for energizing your morning. 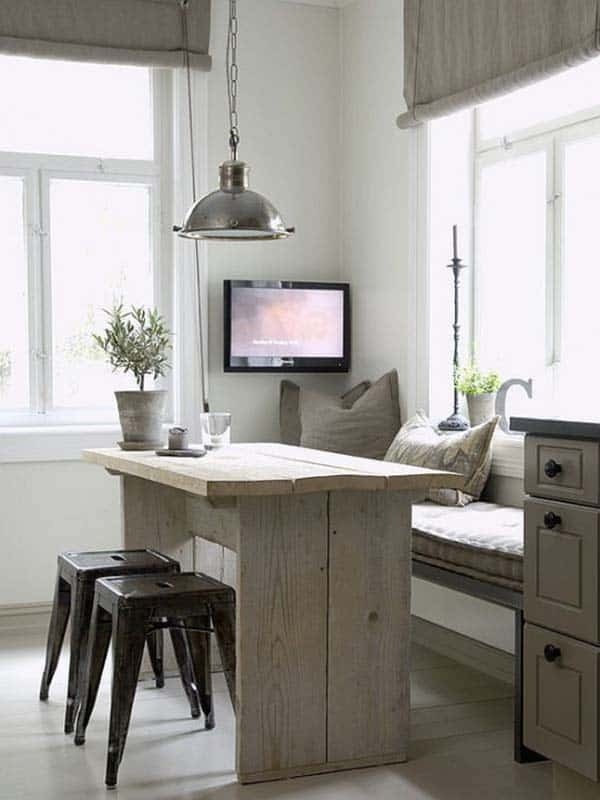 If you have a small kitchen space that needs a breakfast area, this is a clever way to create an addition. 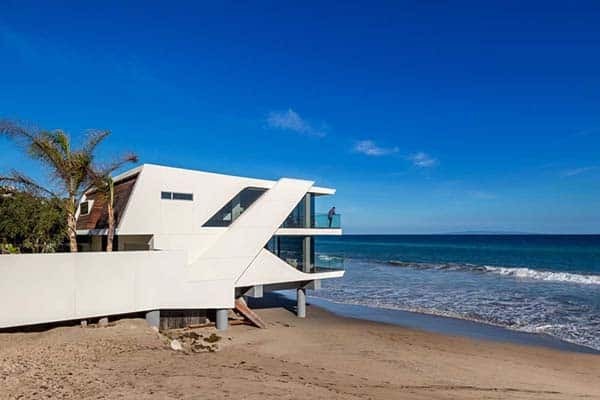 Just build the space out if you have it available to you on your property, a very cost-effection small addition. 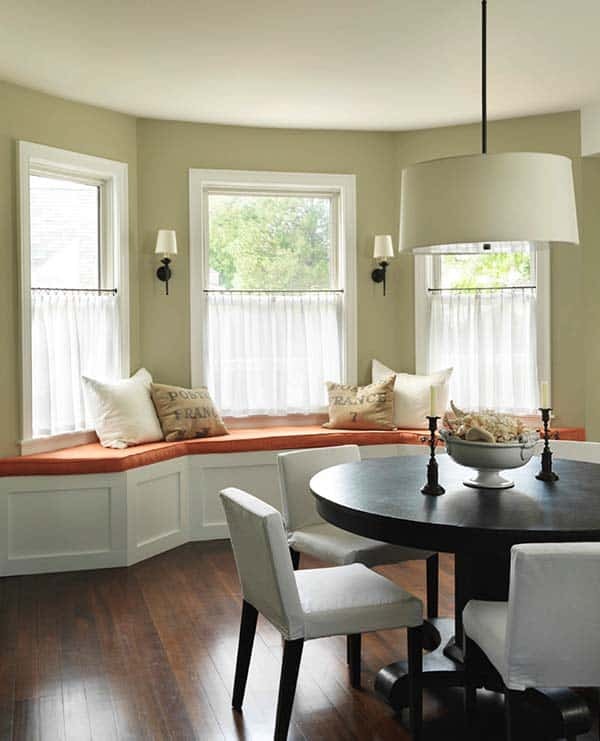 Take Full Advantage of a Corner: This corner banquette helps to maximize on space. The round Tulip Table keeps the small area open, helping to create great flow. While most banquettes are custom, there are ready-made versions available. 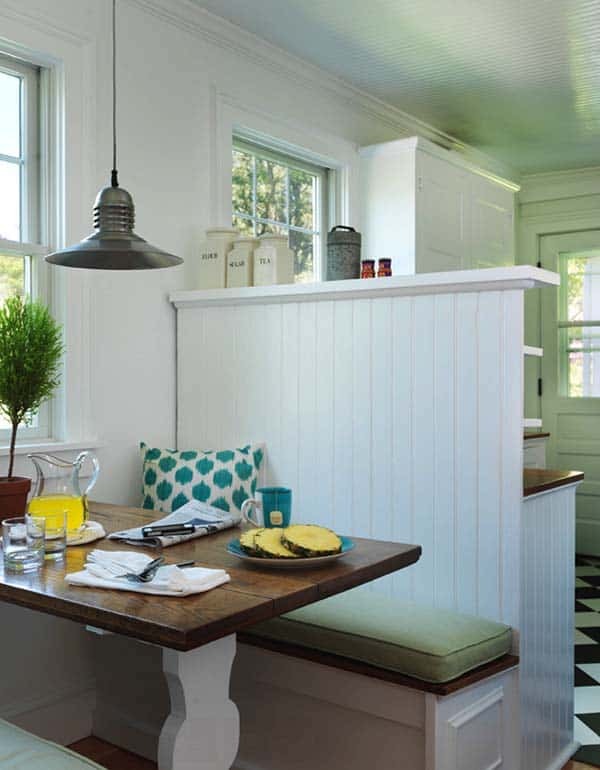 Built-in Bench: If you have a built-in bench in your kitchen, use it as a breakfast nook. This works perfectly if you have a long dining table. Cozy up the bench with some plush and colorful pillows and for additional comfort, add a long seating pad in a neutral color to not compete with the pillows. 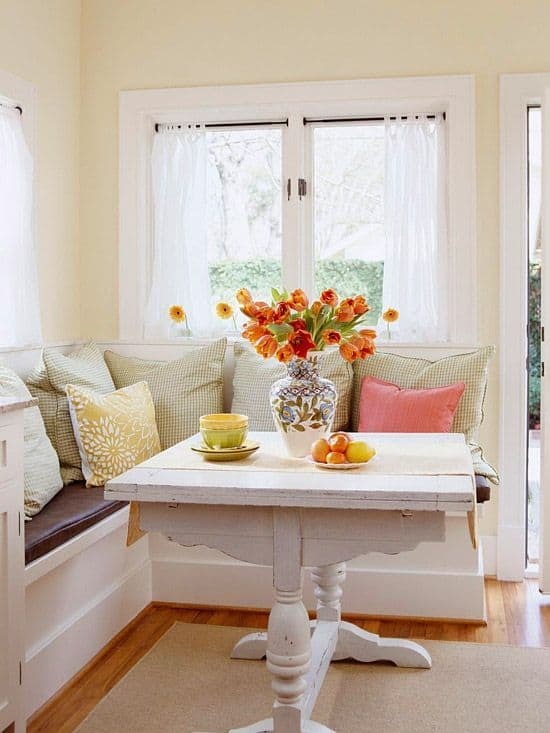 Tip: Change pillows with the seasons to create a different look and feel to your breakfast nook. 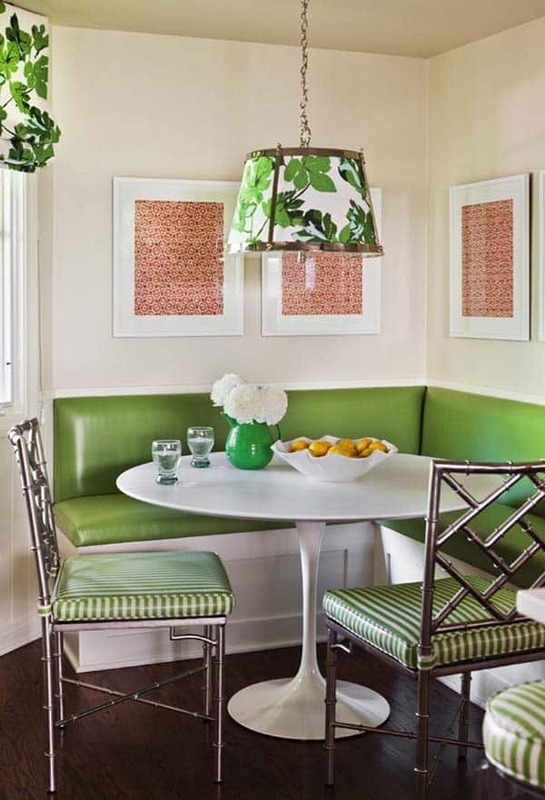 Vinyl Nook: This has a more old-fashioned type of feel with vinyl coverings for the banquette. On the plus side, it is very easy to wipe down, which means kid friendly. The green hues against the white woodwork , trim and walls creates an uplifting ambiance. Try Mixing Prints: In an all white kitchen, adding colorful fabrics to this built-in booth creates a more welcoming space. 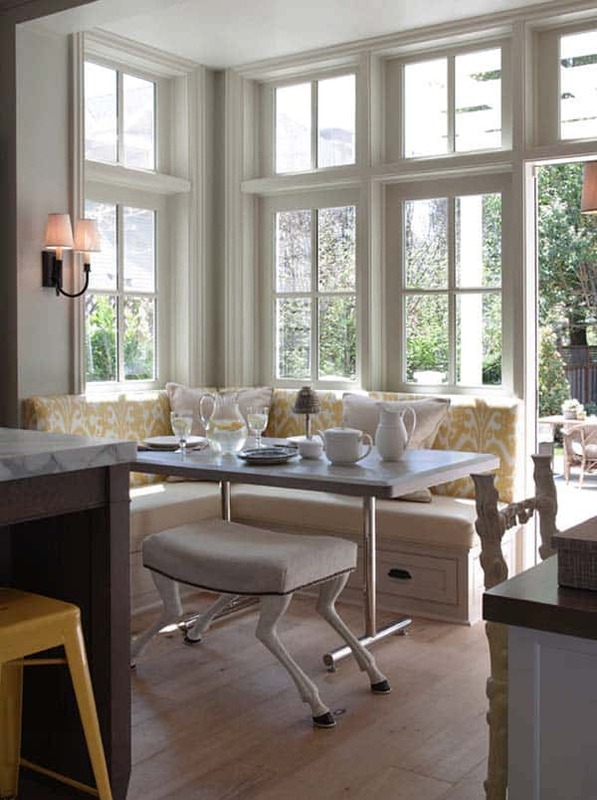 Take Advantage of a Bay Window: This built-in nook follows the lines of the bay window, creating a curvaceous eating spot. 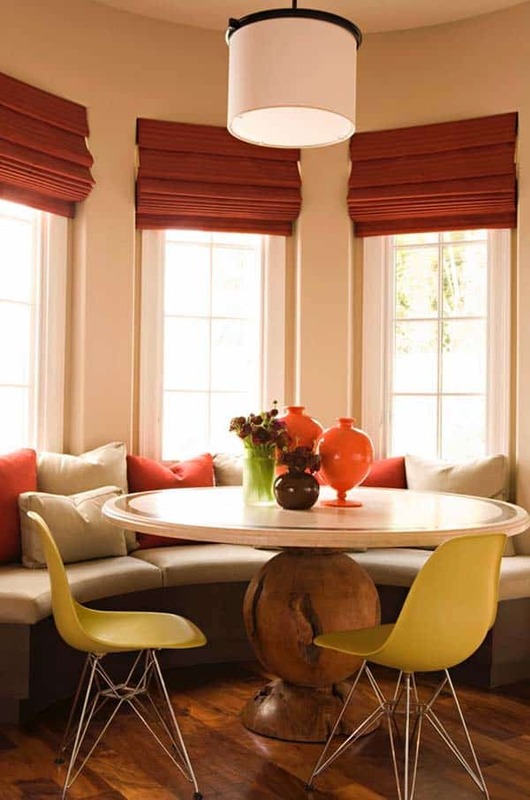 The rounded table follows in harmony, with pops of color creating a very appealing atmosphere. 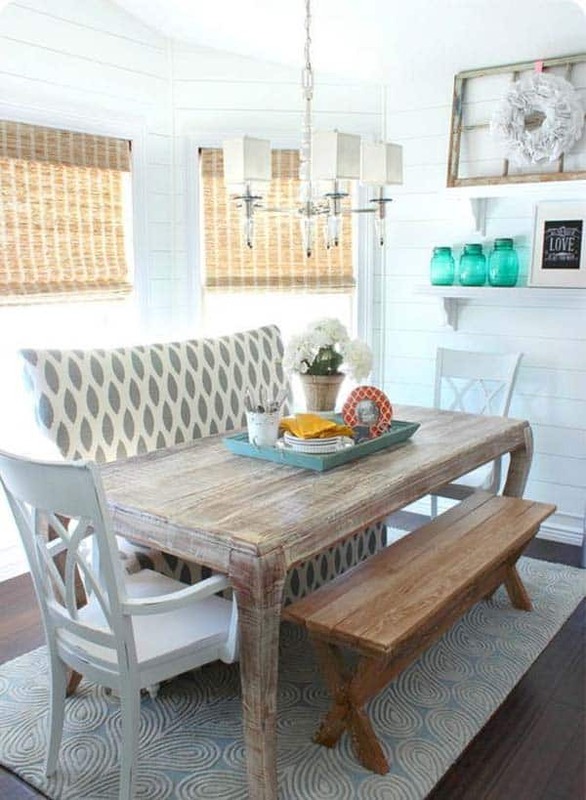 Farmhouse Style Nook: A whitewashed trestle table creates a rustic appeal that is super inviting. Limited Space: If you find that you don’t have a lot of space for a breakfast nook, consider a small pedestal table that can be tucked in just about anywhere. 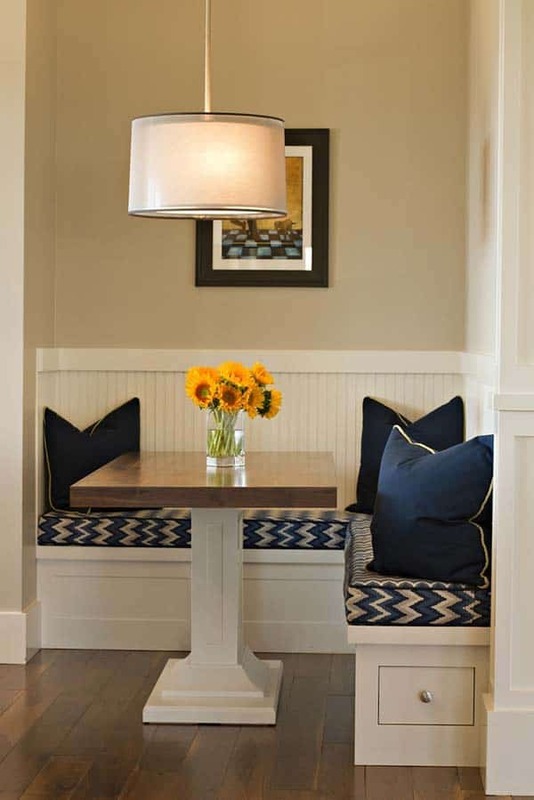 A two person banquette makes it very cozy, a cute little nook that fits the bill! 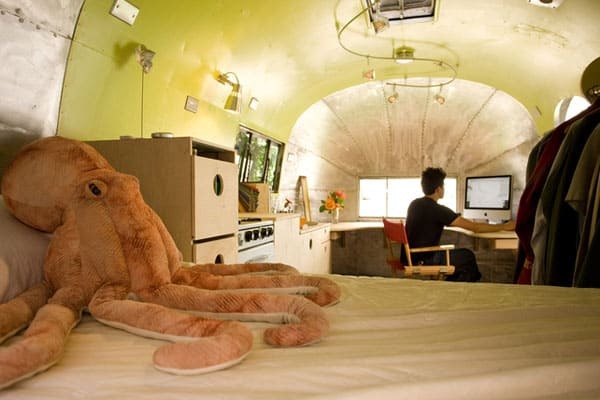 Feature Lighting: Add a touch of whimsy to your space like the adorable nook above. 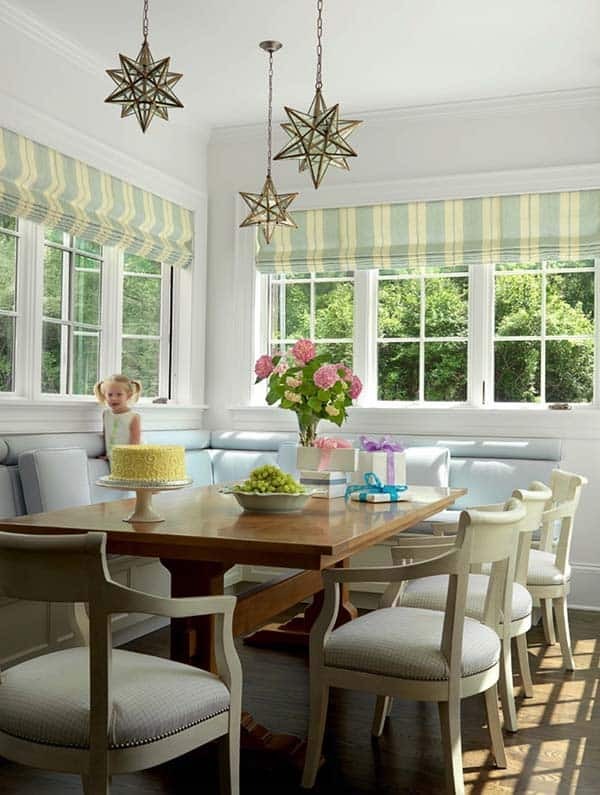 Moravian star light fixtures have been hung at varying heights for interest. To create mood lighting for the space, add a dimmer switch, perfect for the evening! Maximize on Storage: If you have a built-in banquette, utilize the space underneath to store items such as linens, cookware, magazines, toys, the skies the limit! Cozy Niche: Like most, this nook takes full advantage of natural light and views by taking up residence next to a bank of windows. 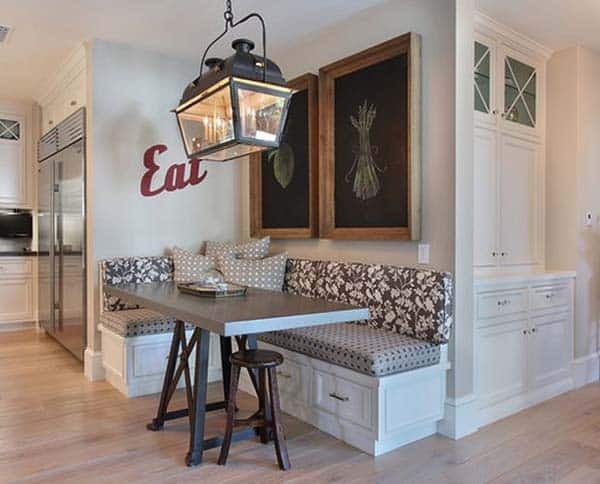 Low, plush benches makes the breakfast nook casual and comfortable. 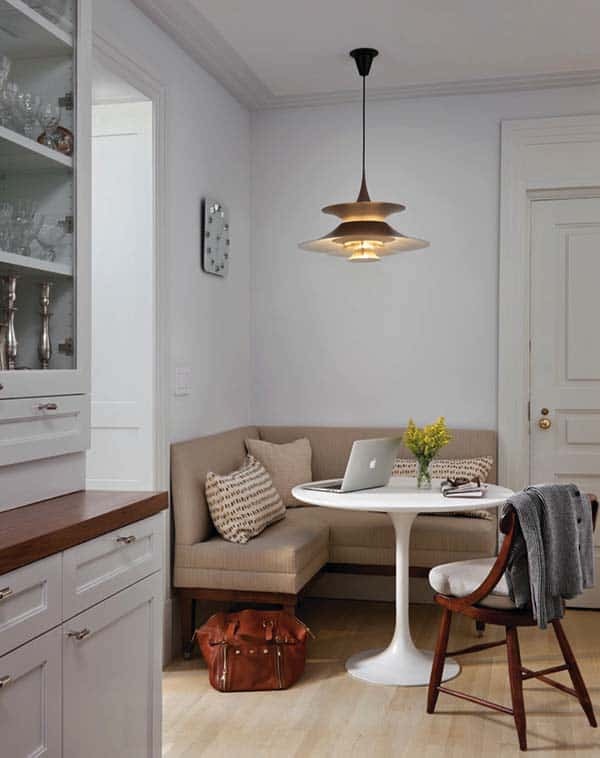 Functional Storage: Once a small and awkward corner, this breakfast nook was transformed in a practical space. This space is dual purpose: a place to lounge and have a bite and also a functional storage area with shelving above and drawers below. Create a Bright and Airy Nook: With plenty of windows, this cool nook gets lots of natural light and an extra glow from the glossy green paint of the cabinets. The white tile backsplash that starts in the kitchen and wraps its way around the booth helps to reflect light throughout the space. Finding Space for a Breakfast Booth: If you looking for some extra square footage for your own little eating nook, try looking for space adjacent to your kitchen. Having the separate space gives diners a place to sit out of the way of the chef. It is also a great spot to add some extra storage to your kitchen, such as pull-out drawers, or the bench tops lift up. 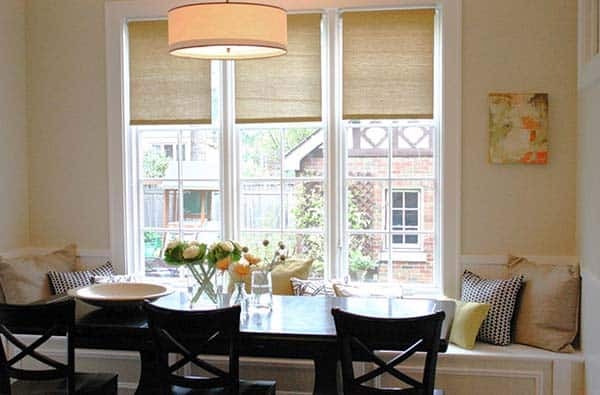 Light-Flooded Bay Window Nook: Create a banquette around bay windows, the perfect area for a breakfast nook, especially if the walls are curved. 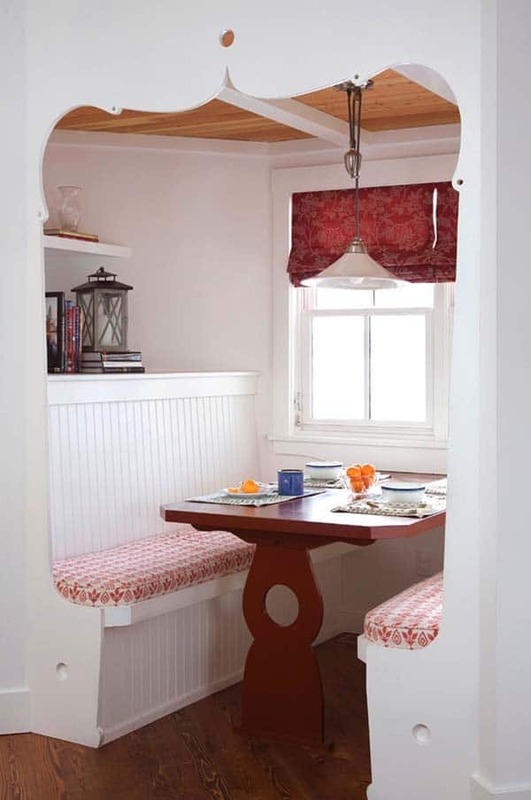 This cottage nook features a built-in bench that hugs the curves of the window and offers plenty of extra seating. 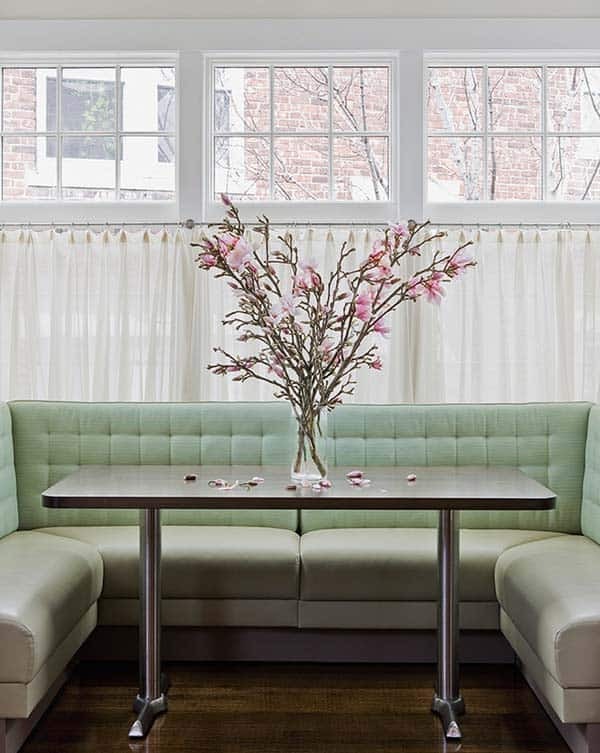 In an oversize space like this, consider using a table with leaves, allowing you the flexibility to host extra diners. 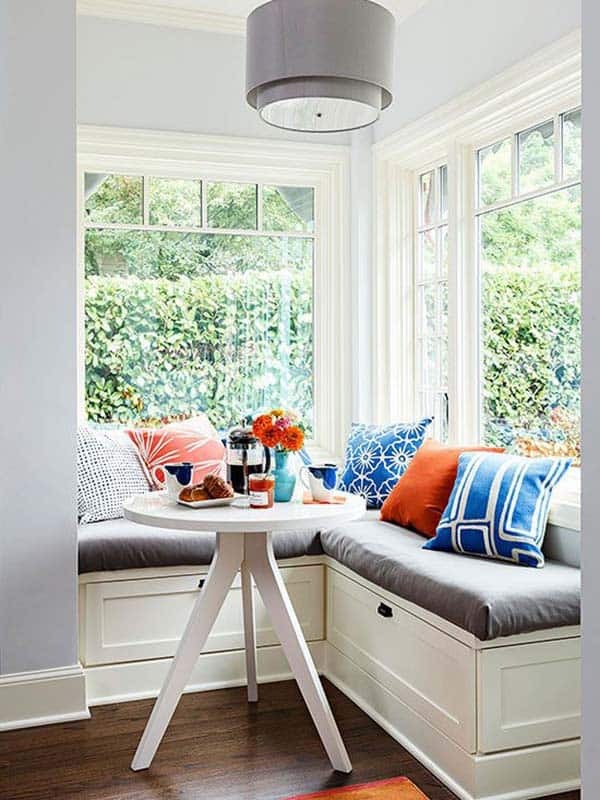 Make the most of a Window Seat: If you are looking for a simple solution to a breakfast nook, just add a table to a window seat. Chairs can be optional, and even pulled in when extra guests come to the table. 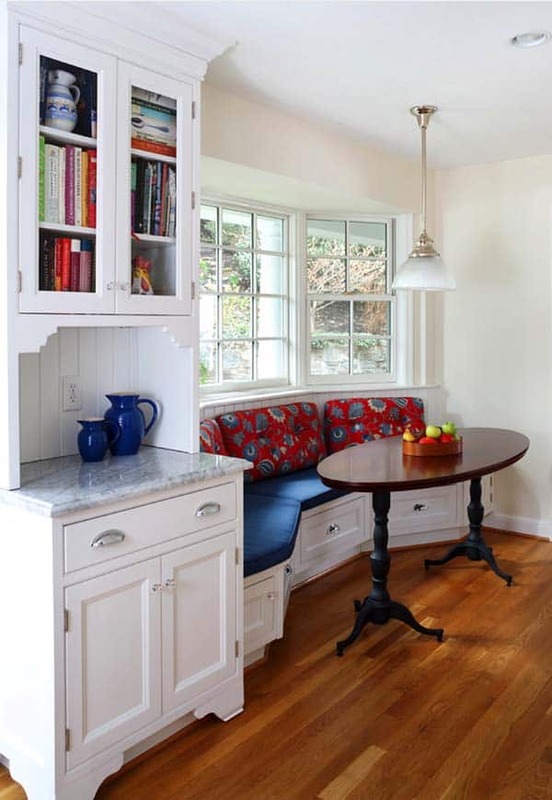 This space was turned into a quaint alcove with corbels added on both sides. The chandelier above creates a shabby-chic elegance. 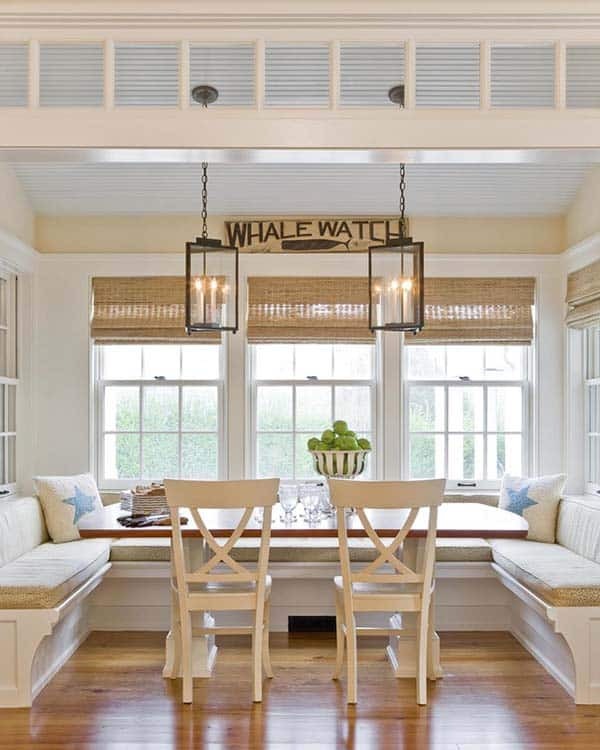 Nautical Breakfast Nook: Extra attention to detail in this nook helps it to blend seamlessly with the rest of the kitchen. 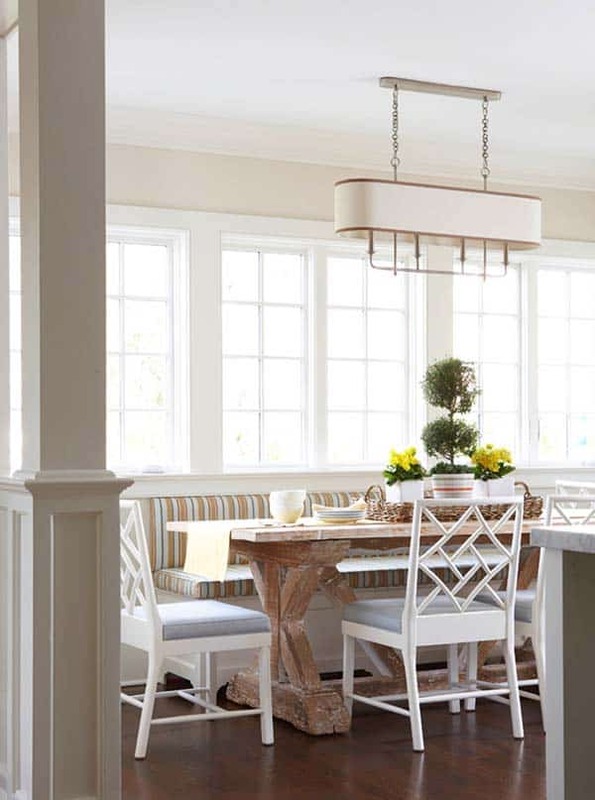 Subtle elements such as the lantern light fixture and bow-like bench helps to harmoniously blend with the home’s maritime theme. 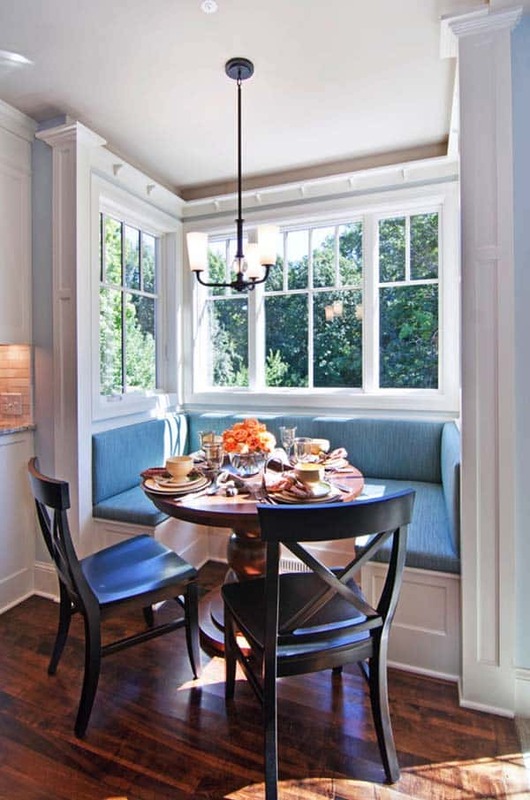 Create Symmetry: Create an elegant look to a small breakfast nook with built-in benches and narrow dining table. An all white nook needed some visual appeal, so patterned fabrics were used to add character and personality to the space. To not overwhelm this tiny space adjacent to the kitchen, a low-key light fixture was installed. 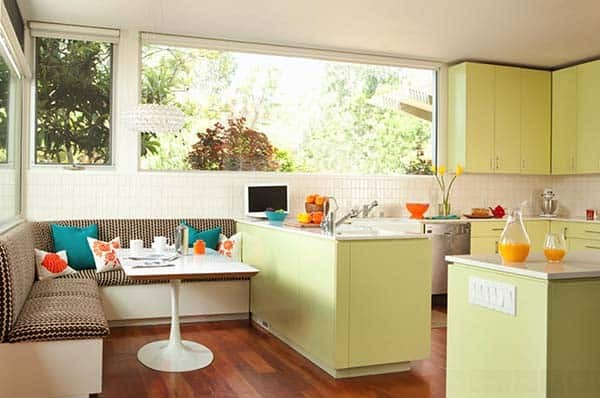 Entertaining Nook: If your kitchen is spacious enough, utilize the extra space for entertaining guests. If this is your only place to eat, you will need to be able to accommodate people in a comfortable manor. Not to mention, having a larger table create an air of sophistication than just a casual two-person table. Delineate Space with an Area Rug: Area rugs not only show a delineation of space, they make it feel cozier when you have bare floors. They can also help to tie a space together and ground a seating arrangement. Depending on what style you have in your home, or what look you are wanting to create, select your rug accordingly. 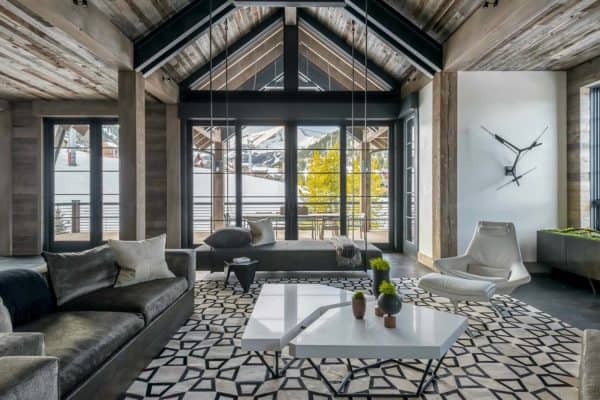 In the image above, a traditional Oriental rug helps to create a more formal atmosphere to the space.